Why must a solar forcing be larger than a CO2 forcing to cause the same global mean surface temperature change? Modak, A., G. Bala, L. Cao & K. Caldeira, 2016: Why must a solar forcing be larger than a CO 2 forcing to cause the same global mean surface temperature change? Environ. Res. Lett., 11, 044013, doi:10.1088/1748-9326/11/4/044013. Many previous studies have shown that a solar forcing must be greater than a CO2 forcing to cause the same global mean surface temperature change but a process-based mechanistic explanation is lacking in the literature. In this study, we investigate the physical mechanisms responsible for the lower efficacy of solar forcing compared to an equivalent CO2 forcing. Radiative forcing is estimated using the Gregory method that regresses top-of-atmosphere (TOA) radiative flux against the change in global mean surface temperature. For a 2.25% increase in solar irradiance that produces the same long term global mean warming as a doubling of CO2 concentration, we estimate that the efficacy of solar forcing is ~80% relative to CO2 forcing in the NCAR CAM5 climate model. We find that the fast tropospheric cloud adjustments especially over land and stratospheric warming in the first four months cause the slope of the regression between the TOA net radiative fluxes and surface temperature to be steeper in the solar forcing case. This steeper slope indicates a stronger net negative feedback and hence correspondingly a larger solar forcing than CO2 forcing for the same equilibrium surface warming. Evidence is provided that rapid land surface warming in the first four months sets up a land-sea contrast that markedly affects radiative forcing and the climate feedback parameter over this period. We also confirm the robustness of our results using simulations from the Hadley Centre climate model. Our study has important implications for estimating the magnitude of climate change caused by volcanic eruptions, solar geoengineering and past climate changes caused by change in solar irradiance such as Maunder minimum. Figure 1.Changes in TOA global mean radiative fluxes (W m−2) plotted against global mean change in surface temperature (K) for 2xCO2 (black) and SOLAR (red) experiments. The global mean changes are the average of the NCAR CAM5 12-member ensemble runs for 5 years with monthly resolution (S1). Lines represent linear regression fits in the two cases. 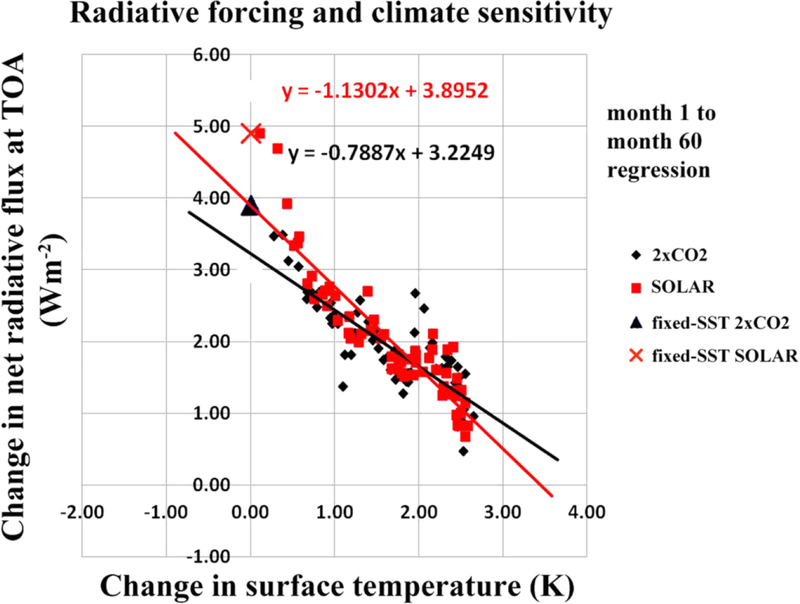 Cross and triangle shows the radiative forcing estimated using fixed-SST method for the SOLAR and 2xCO2 cases, respectively. The climate sensitivity is smaller (steeper slope) in the first four months in the SOLAR than in the 2xCO2 case. Figure 5. 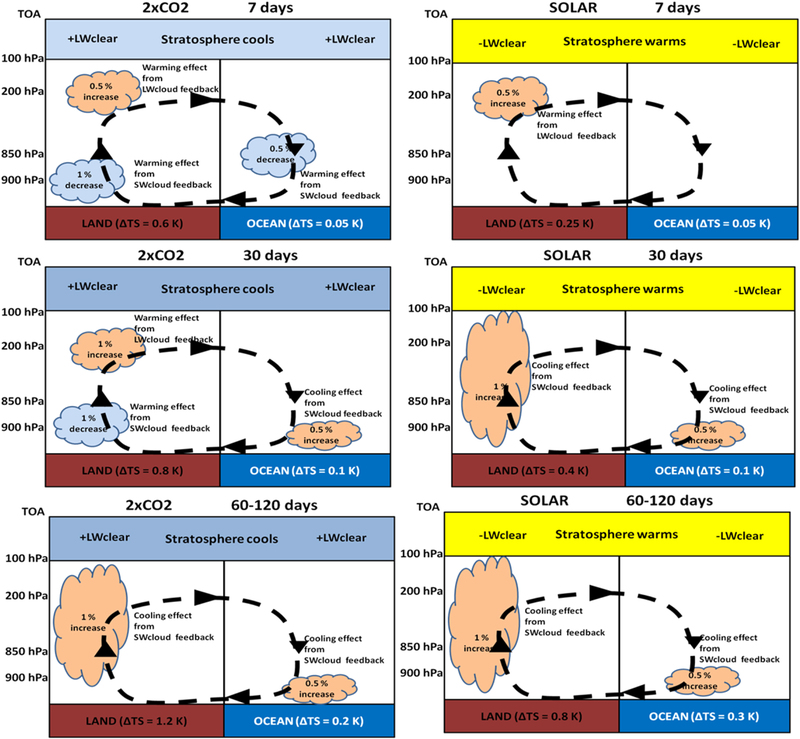 A schematic illustration of NCAR CAM5-simulated rapid adjustments over land and ocean after first 7 days, 30 days and 60–120 days in response to a doubling of atmospheric CO2 (left panels) and a 2.25% increase in solar irradiance (right panels). Orange shading represents an increase in the cloud fraction while blue represents decrease in the cloud fraction at the level as shown in the diagram. Blue color for the stratosphere indicates stratospheric cooling while yellow represents stratospheric warming. Dashed line represent the monsoonal type circulation initated by the rapid land surface warming. The low cloud decrease over land in the 2xCO2 case is mainly due to the CO2-physiological effect as can be inferred by comparing figures 3 and S8.